Custom fabricated trailer with electric brakes on all axles, break away system, heavy duty fenders, and light hookups. We can build one of our own models or custom design one to fit your needs. The trailer is the foundation to your tiny home. We make sure it all stays together even at 60 MPH! 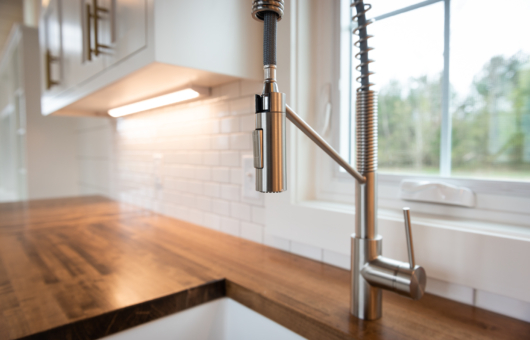 All plumbing and wiring is done by licensed trade professionals. Here is where we let our experience and expertise work for you. The details matter. Doors can be on the side or end of the home. We can use french doors or doors in multiple locations. Our standard door is painted fiberglass and we offer optional stained wood doors as well. We can source a wide variety of doors to fit your style. Windows open your home to the outside and make the space feel spacious. We can do casements, double hung, or awning windows and most of our homes feature some combination of these. With the aluminum clad windows there are many colors to pick from to match your tastes. 3/4″ Pine T&G with a clear coat is the tried and trued classic on the walls, but we can also paint it, solid stain it, or mix and match. 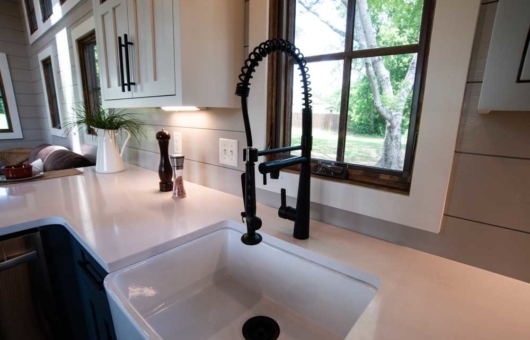 Most homes have a combination of several finishes. The exterior of our homes feature LP Smart Side products. We have lap siding, board and batton, or shakes available . We also can do vertical metal siding for a more rustic look. Our flooring is 3/4″ tongue and groove pine hardwood. It can be stained and sealed or painted. We can also do laminate or prefinished hardwood as well. We build our cabinets in house so you get the most customization possible. They can be painted, stained or a combination of both. The appliances are compact or can be RV style and size. Cooktops are gas, fridge and washer/dryer is electric. Sinks are stainless steel. Dry or wet, shower or tub, sink or no sink, we can usually accommodate your needs. We also offer tile shower surrounds for the ultimate in luxury and style. Plumbing is installed by licensed professionals. Due to the fact that most of these building will be traveling at highway speeds at some time in their life, I only offer metal roofing for the ultimate in durability. Standing seam painted metal or old fashioned galvanized metal are options. Our homes come with standard RV style hookups for water, electric, and sewer. If you would like to go off grid or have separate grey water drains we can customize to your specifications. We supply all lighting fixtures and prefer to use quality products that match the style and decor of the home. Dark sky lighting is provided on the exterior as well. Most of our homes come with sleeping lofts. We can build a ladder or combination storage compartments/steps to get up there. Delivery anywhere in the country! 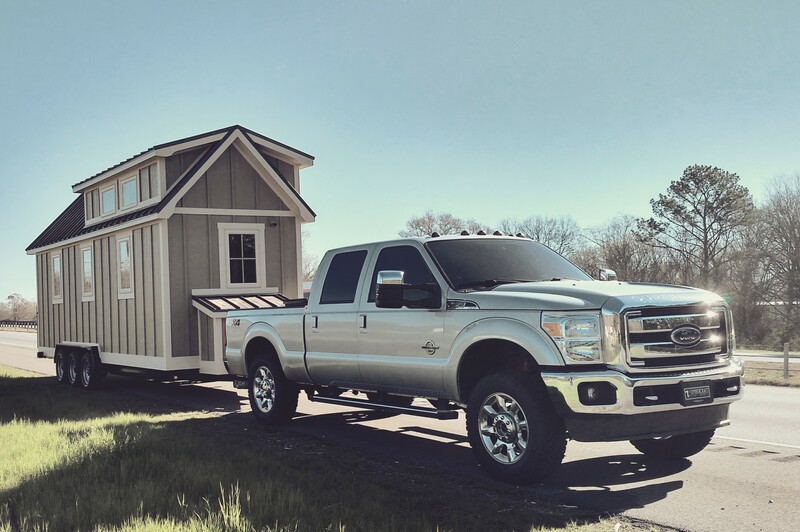 We will deliver our tiny homes on wheels anywhere in the country for $2.50 per mile from Guntersville, AL 35976. Our luxury tiny house amenities and delivery service are simply unmatched. We can build your tiny home on skids. This service is limited to more local areas since delivery can be quite expensive. Tiny buildings for all your needs. Whether it’s a guest house, studio, personal office, mother-in-law suite, rental, playhouse, or primary dwelling we have you covered.